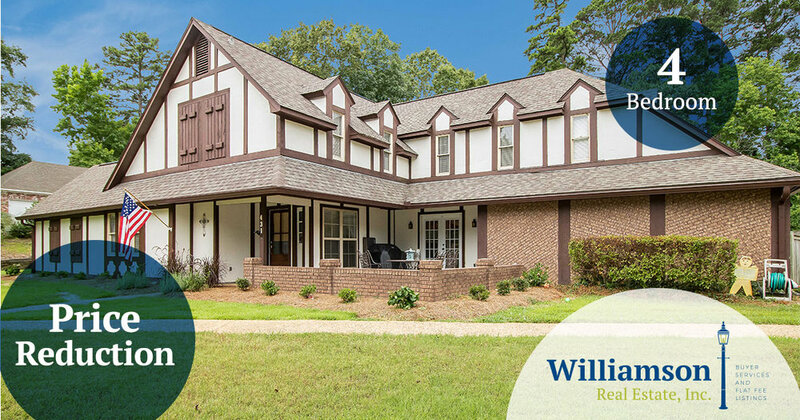 Beautiful Tudor style home in a premier neighborhood! Situated on a large corner lot, this home has four bedrooms, three and one half baths, and plenty of space for your family. Inside you will find a spacious family room, complete with vaulted ceilings, built-ins, and inviting fireplace. This leads you to the formal dining room and renovated kitchen. The kitchen has been updated with a down-draft stove top, stainless steel appliances, granite counter tops with tumbled marble backsplash, and under cabinet lighting. The kitchen overlooks the front and back patio. Two French doors lead to the front patio and back porch. You will love the enormous master bedroom featuring a tray ceiling and reading nook. The built-ins include an entertainment center, his and her dresser, stereo surround sound, and custom shelves. The walk-in closet has a second laundry center and more built-in storage. The spa-like master suite is outfitted with a 6 ft. whirlpool tub, large walk-in shower with two shower heads and body sprays. The two sinks are outlined with a large mirror and completed with a vanity area. Upstairs has three large rooms with new carpet. There are two full bathrooms, and a laundry room upstairs. Also upstairs are two floor attic spaces and complete access to hot water heater and HVAC. The updates include HVAC complete system (2016), Siemens electrical panel (2015), light fixtures, and roof (2014). The spacious back yard includes heated and cooled shop. The shop has a rollup door and full electrical panel for any additions. The driveway leads up to a large two car garage and a driveway area that can easily hold up to 6-8 cars. Offered for $252,900.00. Call 601-540-1197 to schedule your showing today!